Madeline Presper is from Akron, Ohio and a graduate of John Carroll University with a major in Sociology and minor in Psychology. While a student at John Carroll, she spent a semester abroad at the National University of Ireland, Maynooth. She is now living in the Garfield neighborhood of Pittsburgh, Pennsylvania as a member of the Pittsburgh Urban Leadership Service Experience (PULSE) program. 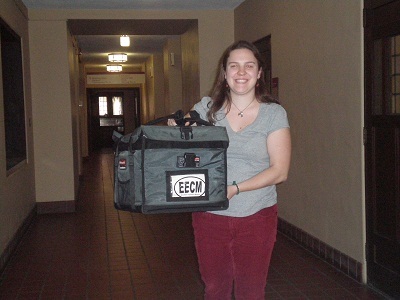 Her placement is with the East End Cooperative Ministry (EECM) as the Assistant Volunteer Coordinator. My walk to work, with a view of down town East Liberty, including the church my office is in. I start my day off by making the short walk to work, it is a nice time of the morning for me to continue the “waking up” process and to think about what I need to accomplish that day. When I arrive at East Liberty Presbyterian Church (where my office is located), I pass through the kitchen to see which volunteers have arrived and talk to our chef to make sure we have enough help for her to prepare both the Soup Kitchen lunch and the Meals on Wheels food. I then make my way to my office to check the call-off line to see if any volunteers are unable to come in that day. 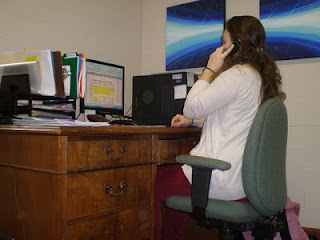 I talk to my supervisor and the Hunger Program staff to review what positions need to be filled for the day or for days later in the week; based on this I make phone calls to try to adequately cover all of our necessary volunteer positions. I work for EECM, with my office located in East Liberty Presbyterian Church (one of our member congregations). In October EECM will move into its own building nearby. As the Food Pantry and Meals on Wheel volunteers arrive, I greet them and review any important new information for the day. If there are not enough volunteers, I fill in where needed, which in the morning is most often Meals on Wheels. I enjoy being a visitor for Meals on Wheels because it allows me to interact with the elderly in my community, and also spend time getting to know the volunteer or staff member that is driving me. When we return, I clean out the carrying containers from all of the route, and head back to the office to have lunch and prepare for the afternoon Food Pantry. Again, if help is needed, I fill in by filling out the paperwork for new clients, filling bags of canned goods, or packing the produce, meat, and dairy products. If I am not needed, I work ahead on the schedule for the upcoming week. Checking the call of line. 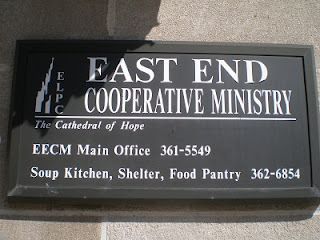 Once Food Pantry closes at 3:00pm, I input any new volunteer contact information we have acquired throughout the day and look over the schedule so I am prepared for the next day. On Friday I also collect the volunteer sign in sheets and verify that everyone signed in. I also prepare the hours for a volunteer to input in our database. I then send the schedule for the following week to the staff so they are aware of when they might need to fill in. Returning from Meals on Wheels deliveries. 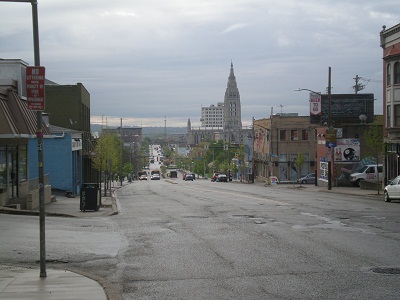 After my walk home (up the Pittsburgh hills!) I spend time watching TV, playing basketball, reading, learning guitar, or napping. My three housemates and I try to eat together on weekdays; I cook on Monday and clean dishes on Wednesday, with my housemates taking care of the other days. One day a week we meet up with the other PULSE house, which has 8 people, we cook and eat together, with my house buying the groceries and hosting every third week. We also see each other on Wednesday, when we only work a half-day, so that we can spend the rest of the day doing service (tree planting, dump site clean-up, food bank packaging), receiving training (resume building, effective communicating, grant writing), or learning about and experiencing Pittsburgh (learning about the city’s film industry, going to the zoo). 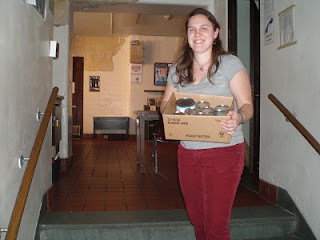 Carrying a box of canned goods for the Food Pantry. Aside from our scheduled time together I also like to visit the other house in the evenings to watch movies and play board games. On Wednesdays we sometimes attend Banjo Night at the Elks Club. And on the weekends we try to get out and be a part of the city. We like to attend art walks, football games, concerts, and movies. Though we like to have fun, we also sometimes spend the weekend on home improvement, such as working on the community garden in my backyard, or building a patio and pergola in the backyard at the other house. I also try to make time to spend with my sister who just finished her freshman year at Duquesne; it is really nice having her around, though coming from Akron, home is not too far away! It has been a great year so far, and I hope to stay in Pittsburgh for years to come. 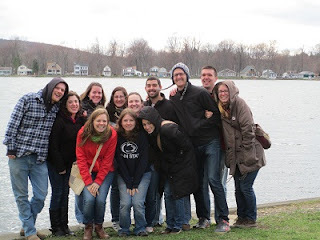 2012-2013 PULSErs on Spring retreat at Lake Chautauqua! PULSE cultivates a community of young servant leaders to transform Pittsburgh. We invite talented university graduates to partner with local nonprofits for a year of service and leadership. Members serve with a local nonprofit, live in intentional community and participate in ongoing personal and professional development. For more information, click here.